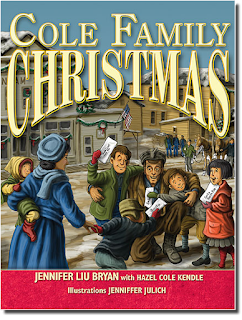 Cole Family Christmas by Jennifer Liu Bryan with Hazel Cole Kendle is a wonderful story I had the opportunity to share with my children. We all really loved this book and reading it will probably become a holiday tradition for our family. The story is about the Cole family, Papa, Mama, and nine children. It is set in 1920 Kentucky, in a coal mining community. The family has very little, which was typical of the time. The book talks about love, family, and the true meaning of Christmas. We all grew to love this family. I really enjoyed the fact that they reinforced the things we all should remember about the holidays. I think it's a great book for families to share! This book gets my five stars from me and my little ones too! I highly suggest adding a copy of Cole Family Christmas to your family's library. You can read more about this heart warming story and it's authors here. This looks like a fun one to rad with the kids. Might look it if you don't mind. I'd like to get a hold of that book, it sounds like a really good one and one my whole family would enjoy.